It’s that time of the year, when high school juniors and seniors start standardized testing for college admissions. There’s a long list of what you can and can’t bring into the testing room, and watches for keeping track of testing times are one of the few allowed things. My daughter grew up in the digital age, and she has trouble telling time quickly with the old analog clocks in the rooms of most classrooms. This makes it harder for her to estimate how much time she has left to complete a section, and even a digital watch on her wrist won’t tell her how much time she has left to complete a section. If she had a Testing Timers watch, she’d know at a glance – without wasting a second of testing time trying to calculate how much time she has left. Testing Timers digital watches are designed specifically for standardized testing; there’s a model for the ACT and one for the SAT. Each model is set up with information about each section of the test: subject, number of questions, and time allowed. They meet all criteria to bring in to the ACT or SAT test room. Once testing begins, simply choose the correct category for the section. As the test progresses, you’ll be able to instantly see how much time you have to finish so you can pace yourself. The Testing Timers work great for practicing for a standardized test as well as they work for taking it, too. 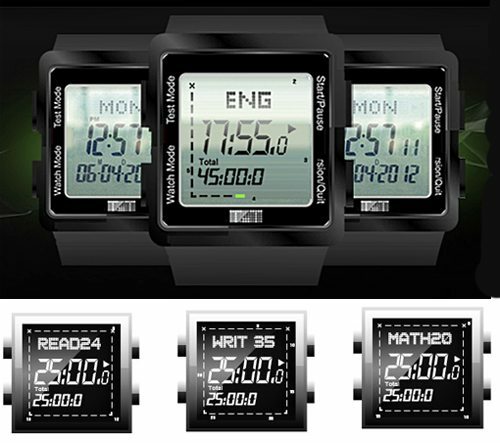 When you aren’t testing or practicing, the Testing Timer serves as a standard digital watch. Right now, only the ACT version is available for $39.99. They should ship beginning 11/10, but you can pre-order now. All other things being equal, there’s no reason why a high-school-age kid can’t learn to tell time with an analog clock, “child of the digital age” or not. Most workplaces and other public places still have analog clocks. As for the testing itself, the proctor should be giving time hacks periodically throughout the test period. There’s no purpose for this gadget that can’t be served by either learning to tell time properly or using a kitchen timer (for practice, etc). @Solace Kaden Most people just check the time on the digital display on their cell phones. Cell phones aren’t allowed at the testing locations. And I didn’t say she couldn’t tell time at all on an analog clock, just that it wasn’t as fast for her. You could also buy a digital sports watch with a countdown timer. I use one as a soccer ref. They cost about the same and can be used for other things. This watch is fantastic. My daughter used the watch and scored three points better. While you think its just a regular watch, it actually does save the kids time. Considering the amount of money I paid on tutoring, this was nothing. It’s basically the price of a shirt. My reviews: it is a must have for all high school juniors! End of story. ^ whatever Solace Kaden said. Also, the “three points better”… as compared to what? Three points higher on her ACT. The time it saved her and the stress she did not have to deal with was enough for her to excel. Many (most?) digital watches come with a (countdown) timer, as well as a stopwatch, so I’d be looking at one of those – cheaper and less “dedicated use” – would you want to wear this after taking these exams? I have to agree with Solace Kaden…teach your kid to tell time even if it means putting an analogue clock on their phones. Technology is a great thing but you should also be able to go without it. I love all my toys and gadgets but I am sure if they all died I would survive (well I hope I would). You know, folks, I was just trying to write an introduction for a news post. My daughter can tell time just fine, but we do joke with her about how she’s never seen a round clock or an old-fashioned phone. You can buy a plain watch with no bells and whistles for $10. I had a calculator watch when I took my SAT, and that was allowed in. That and looking at the clock when the proctor started the test, as well as knowing how much time I had for the section was enough. I really have to question how ready a kid is for college and/or the “real world” if they need such a crutch to reduce the stress of a few hours’ testing. It’s bad enough that so many kids can’t even do basic math or make change without a calculator to tell them the answer – do we really need to encourage them to stop bothering with even more basic skills? I also sincerely doubt that any kid today has “never seen a round clock.” My workplace has them. Government buildings have them. My niece and nephew’s schools have them. I see them on the walls in other public places. Teach your kids to rely on themselves, not on technology. What happens if the watch battery dies during the test? The kid isn’t going to get a “do-over,” that’s for sure. This is a news item about a watch. I attempted to use hyperbole in the introduction so that the post didn’t consist of “this is a watch and it costs $X”, and I attempted humor in my comments. Of course my child has seen a round clock; you’ll notice I said we joke about her never having seen a round clock. It’s our version of parents telling their kids about having to walk to school for 10 miles in the snow – uphill both ways. And she is more than prepared for life. She at least understands hyperbole and humor, for example. There is a competitive watch sold at silentstopwatch.com which is a standard watch (with countdown timer) that has the audio beep disabled. It is marketed for students taking standardized tests, but costs $10 less (with free shipping) and can be used for any test and worn afterwards. It is not customized for the SAT or ACT, but can be used for many other types of standardized tests that require no audible beeps. My test prep company gave me a code to buy this and the price (including shipping) was only $26.99.